For general discussion on this subject, visit the forums at The Trek BBS. 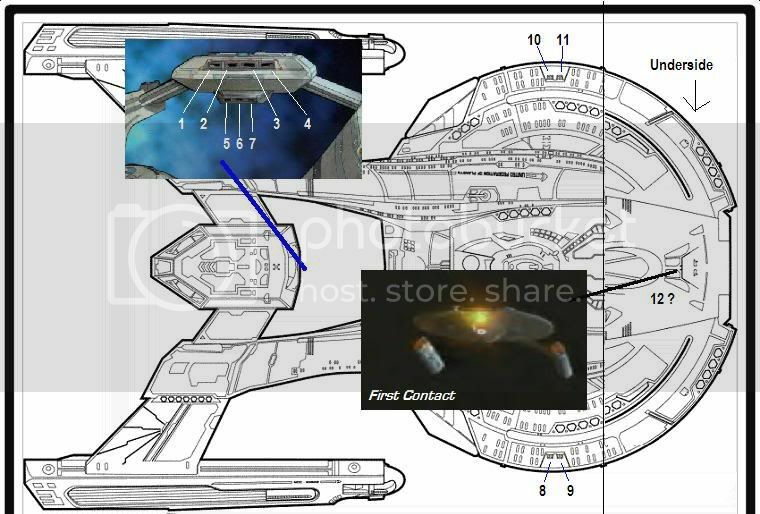 While I'm not 100% aware of the origin of all Fact Files images, I was fairly sure that all "CGI" starships were created as renders from the filming CGI models themselves, without alterations. Meaning that, if there was a computer generated brand schematic of Rabin with registry printed appearing in Fact Files, that means the model was altered like that for use in the show. I just stumbled across this Akira debate--maybe I can help without zeroing some future value on my notes. 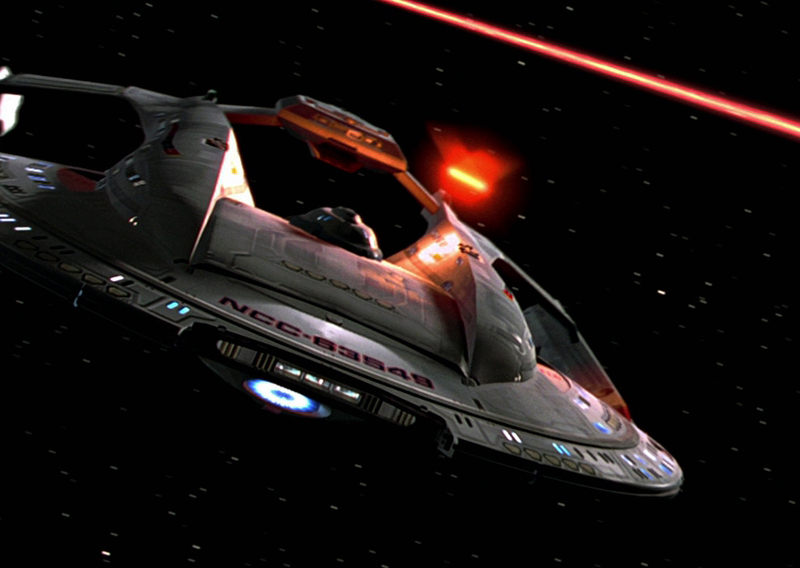 For the record: three or four ship names and numbers were all pre-approved for the four CGI ships of First Contact--"approved," as in Mike Okuda/art dept. got Berman to OK them so that in the heat of the moment the ILM CGI people (and CGI was new, remember) could drop them on the CG models and go--since everything like approvals is so heightened on a movie. I personally saw the approved names page at the time; in my 1999 interview with Alex Jaeger about all this at ILM, I saw his copy and jotted down all the names and numbers. This has never been published--but this is where Akira, Thunderchild, Rabin and Spector (that spelling) comes from, and the numbers. MY list had 635 for Rabin and 655 for T-child...I may have them swapped; I am attempting to check this with Alex as of today, since it is such a confusion factor now. The CGI file we got for Fact Files had -635...but no name. Other clarifications: The ST Magazine text article is mine (see vague, upfront credits list ), from that interview; the other ships' comments and info remains unpublished. 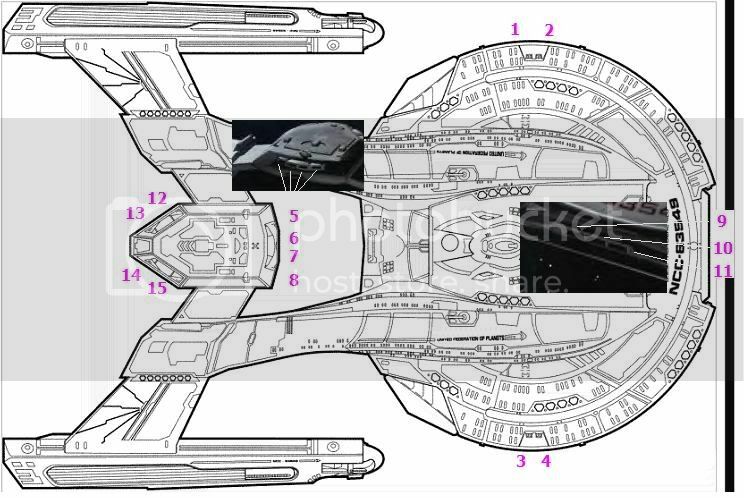 I had Alex circle and mark up with callouts the ship diagrams from the four ships, all from xeroxes from the Encyclopedia, as we did not have CGI files at that time. (Sadly, of course, the artist intention is not always carried out, or back then the elements were all in a vacuum--a siatuation more modern CGI use has slimmed down, TV and movies alike. But at least I have them). And yes, all CGI in the Fact Files was direct from the files obtained from Foundation or Digital Muse/Eden. ILM wanted a ton of money, but by the time "scary new" CGI was being comfortably dealt with, all these files had passed to the (much easier/cheaper to deal with) TV FX vendors for series use. I am apologizing for the text choices in the first third or so of Fact Files; this was "not my dept" but was eventually cracked down on, but not before the rep was damaged. In their defense, the Brits *were* promised this huge degree of tech and source detail they were used to having for resources with their other techie partworks, and then were left hanging when it didn't exist--no excuse, but that's what happened. I did some tech writing (the topics no one else could "humanize"), but mainly I tracked source refs, imagery and art materials in both the unchartered Licensing archives (some buried, that the dept. didn't even know existed) or from cherished, chased-down personal sources or other sources like the various Trek art departments. The Fact Files get a lot of abuse now, but they pioneered and PAID FOR a lot of research and original art —AND frame grabs, and CGI acquisition—that Pocket Books and other licensees, and even Paramount— never had the stomach to get into. And all at a pre-digital time when the poor 35mm episodic slides and Licensing reference snapshots had been exhausted before weary Trek readers' eyes for years. Saucer: 7 total, 3 forward below the front shuttle bay doors, 4 in dorsal surface, 2 port, 2 starboard. The latter four face out to port and starboard, respectively - so far as I know these are the only torpedo tubes we've ever seen which don't fire parallel to the direction of motion. Finally there is 1 in the lower hull section, just below the deflector dish." The above I quoted from Ditl.org, therefore I didn't write it. Recently, someone changed the informations in the "Technical Manual" section again to get the infamous "fifteen torpedo launchers" in there. It show four tubes or ports that the photon is fired from. This is a GIF of Thunderchild firing her torpedoes from the pod. If someone has a high definition version of ST:FC, they should be able to do a close up on the Thunderchild as it fire off from the pod. All I can tell you from the gif is that Thunderchild may have fired one photon each from 3 of the 'visible' ports as shown in the first Image. Or it may be firing 3 photon from one tube, but you would need to slow down the sequence and do a close up of Thunderchild.